This woodblock print was produced from an original painting on silk dating from the late 1920s whose current location is unknown. The indentification of this design as number 58 is original to Rakusan who published the print as the 58th design in his series of one hundred woodblock prints called 楽山花鳥畫譜 Rakuzan Kachou Gafu, lit. 'Rakusan's Flower and Bird Print Series'. Initial edition I publication of 58 was in September 1931 (or perhaps slightly later) in installment twenty-nine (of fifty). However, additional edition I printings of 58 may have continued until as late as 1933. The copy illustrated here is typical of edition I. Although 58 was reprinted in both later editions, few copies are known; and those print runs were likely smaller than those of edition I. Edition II copies can only be dated approximately to between 1936 and 1941. An edition II copy of 58 was included in a Rakusan presentation album from August 1941. Edition III copies can only be dated approximately to between 1948 and 1955. Edition I: Background only very subtly darker at the bottom; more intensely darker at lower left. Shadow color almost same as tan background. Edition II: Background has darker bokashi over the entire lower portion. Shadow a different and distinctly darker brown. Edition III: All of the colors including the background are darker and more contrastive. Shadow olive or dark green rather than brown. The title-caption for 58 is unusual in that it is one of only three in this series which mention a landform feature in addition to a botanical and a bird. Here, 池 ike is 'pond'. Edition II: Mead Art Museum, Amherst College, Amherst, MA, USA; (1942.44.d) [illustrated online]. Lotus (Sacred Lotus), Nelumbo nucifera, is usually called 蓮, 藕, はす, ハス, hasu, 'lotus', which is also a general name for any kind of lotus. Botanically, the species is today often called instead 大賀蓮, おおがはす, オオガハス ooga-hasu, lit. 'god lotus'. Lotus is culturally very important for its religious connections as well as for food and ornamental usage. There are many names which can be applied to this species, and several other kinds of plants have names which incorporate names for 'lotus'. Here Rakusan used a specialized term, 荷葉, ka-you, 'lotus leaf' instead of the name of the plant. The descriptor 枯 kare usually means 'dead, dried', but in this context 'cold-withered' or 'winter-dormant' is a more accurate translation. Long-billed Dowitcher, Limnodromus scolopaceus, is today usually 大嘴鷸, 大嘴鴫, おおはししぎ, オオハシシギ, oo-hashi shigi, lit. 'large-billed sandpiper'. (鷸, 鴫, しぎ, シギ, shigi, is actually a very general name not just for sandpiper, but for any member of the sandpiper family, the Scolopacidae.) Rakusan instead wrote 大鴫, oo-shigi, lit. 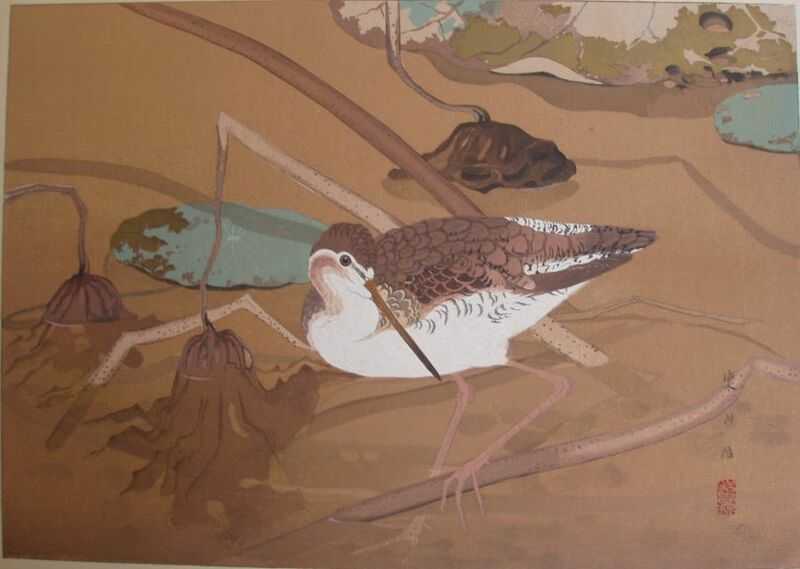 'large sandpiper'. Since this is not recorded as a common name for the dowitcher, it appears that here Rakusan was supplying a general description rather than a species name.